Alaska Cruise 2017- The Ruby Princess — Always Packed for Adventure! Dan and I were fortunate to take a cruise to Alaska in 2016 and it was such a special experience, that we wanted to share it with Zoe and Felix. Since we were living in Portland, just a short drive from the departure point in Seattle, we decided that the summer of 2017 was the perfect opportunity to take the kids to Alaska. 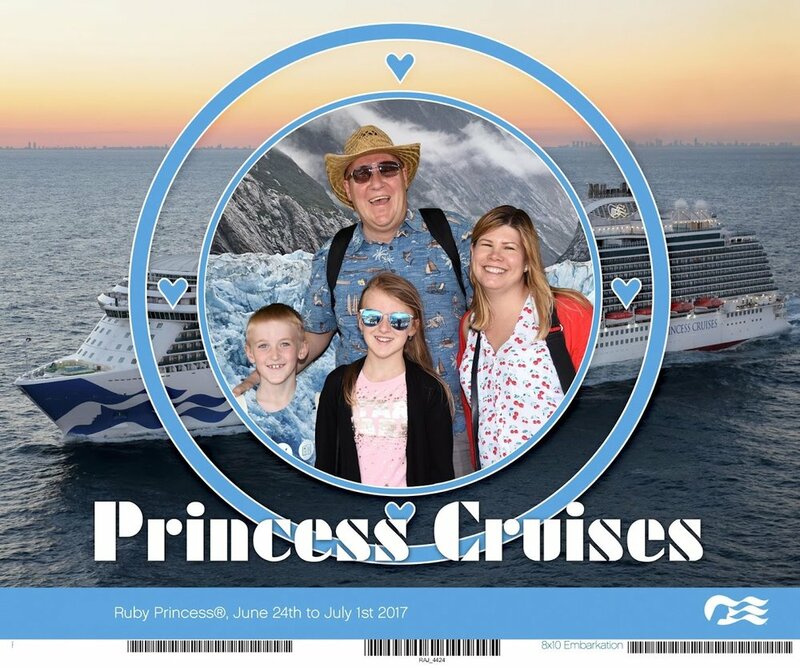 We booked last minute ( just a few months out) and secured a cabin on Princess Cruises' Ruby Princess. A shout-out to our travel agent, Chris Lee, the owner of "I'm on a Boat" travel agency, for taking care of us. I highly recommend using Chris to help plan your next vacation. He's extremely knowledgable, kind, and helped us get a great deal. Thanks Chris! Our cruise took place last June, just over a year ago. We drove to the cruise port and used the long-term parking option at the cruise terminal for our car. Here we are waiting for the shuttle to the cruise terminal. The first picture of the holiday! Greetings at the cruise terminal. There was plenty of staff on hand to make our embarkation process a breeze. We arrived a few hours before we set sail and we were on the ship within fifteen minutes. Here are some shots of the Ruby Princess. These were taken at different ports in Alaska, so you'll notice the different weather. 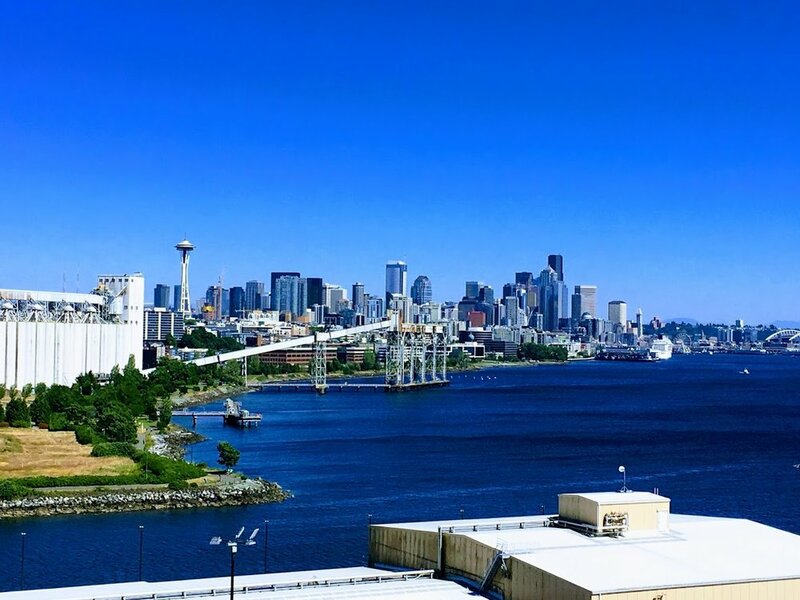 Seattle blue-skies and Alaska gray. If you've been on a cruise, you'll know that photos are taken of you at every opportunity. Here is our official embarkation photo. Felix had a green shirt on, hence the blending into the glacier. We all thought it was hilarious. We ended up splurging on the full-photo package. The photographers on the cruise ships do a great job and it's an opportunity to get quality photographs of all of us together. I highly recommend buying on the photo package. On a previous cruise with the kids ( 2 week Mediterranean with Royal Caribbean), we stayed in a large balcony suite and had a ton of amenities that came with booking that class of cabin. This time, we had a smaller budget and booked an exterior cabin with two bunk beds. It was no-frills. That said, we were perfectly happy with the smaller cabin. The thing I've realized about all cruise ships, is they're brilliant with how they design the space and storage in the cabins. We had no problem storing all of our belongings and never felt cramped. With the colder weather in Alaska, we really didn't miss not having a balcony and most of the time, we were exploring the ship or off at a port. I think the space, amenities, and balcony were great when we were in Europe. I used the balcony every single day of that trip. However, in Alaska, we didn't need more than we booked. Here is a look at our cabin. The bunk beds are shows up, in "day-time mode." The cabin attendant put them down every night for us. One thing I always look forward to on cruises are the towel animals. Even though our cabin attendant was attentive and great in other respects, we did not get the much anticipated towel animals. It may sound silly, but the lack of towel animals was a disappointment. We did get turn-down chocolate, which was not a disappointment! The most exciting thing is running around and checking out the ship for the first time. The kids were most interested in the pool. The pool was heated and they used it every day of the trip, even when the temperatures were chilly in Alaska. Dan and I often sat on lounge chairs, bundled-up in winter coats, enjoying hot drinks, while they swam. The Ruby Princess does have a great kids club and the kids attended one session. Kids clubs have never been their favorite thing and they did not return. They did meet kids at the pool that were their age (7 & 9 ), who loved the club. Zoe and Felix did want to attend a party that the kid's club held in the main atrium on the last day of the cruise. They had games, face painting, and crafts. The kids loved it. A giant shark and pelican were leading a dance party! Speaking of dance parties; Zoe and I went to the midnight balloon drop gala party that was held on the last sea day. Dan had a stomach bug and Felix just couldn't stay awake, so the girls went to the party. It had the vibe of a wedding reception, with a live band playing classic hits that manage to transcend generations. We attended two of the main stage shows. Here's a picture of the theatre, nearly empty. The first show was a family-friendly comedian/magician named R.J. Lewis. Admittedly, after seeing a majority of the shows in Las Vegas, we are a tough crowd. That said, we were all delighted by Lewis' show. The second show was Magic to Do, a musical revue featuring songs by Stephen Schwartz. If the name Stephen Schwartz doesn't ring a bell, you've surely heard of his hit musicals: Wicked, Pippin, and Godpell, among others. I'm not at all a fan of Schwartz's musicals and if I had realized that I'd be sitting through an hour of his music, I'd probably have skipped the show. That said, it was an hour of high-quality entertainment. The singers and dancers on the Ruby Princess are all first-rate and the show was a pleasant surprise. As the title of the show implies ( it's also a song from Pippin), there was some magic elements. Considering the limitations on a cruise ship, the sets, costumes and effects were quite the spectacle. We all enjoyed it. Although every evening show was family-friendly, we only attended the two, because the others were not appealing. There was another comedy night and a few other musical revues. Additional entertainment included cruise favorites like bingo, trivia, and game shows. There is a casino and a sports deck with mini golf. Princess Cruises has a partnership with the Discovery Channel and they had special programs with naturalists on board the ship. Often crew members were dressed in lumberjack/jill costumes to reflect our destination of Alaska. And of course, there were the endless art auctions. I'm not sure why cruise ships are so big on the art auctions, but clearly people are purchasing. Our week-long cruise on the Ruby Princess was filled with activities, including four ports and a day of cruising through Glacier Bay. Coming up: Dining on the Ruby Princess and port reviews! Here are a few shots as we sailed away from the port in Seattle, heading towards our Alaska adventure!